This movie has no point! This movie has no point! This movie has no point! I don't mean to freak out, but I need to desperately impress upon you the fact that this movie has no point. Literally. No. Point. "Based on a true story," it's just a snapshot of like, a month of some guy's life. Seriously? Can I make a movie about my days spent blogging and doing dishes, cast Kate Winslet in it and call it a movie? This movie has no freaking point!! 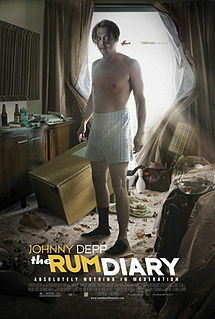 Final word: If you just want to watch Johnny Depp act drunk for 2+ hours, go rent The Pirates of the Caribbean. Any of them. Great Movie Challenge update - It's clear that sheer quantity has done me no favors. I feel like I've wasted hours of my life watching crappy movies I wish I'd never seen. Ahem, above. I plan to devote my final 10 days to picking movies of quality. We'll see if I'm able.